Get free advice and estimates from air-conditioning and heating contractors in your city. As you pull yourself out of bed in the morning and shuffle towards the bathroom, there is nothing more uncomfortable than cold air, drafts, and chilly temperatures. It may wake you up, but it can also be an ongoing source of frustration for homeowners. There are many ways to heat your home, and we’re going to explore two popular options — radiant floor heating 1 and radiators. In the sections below, we’ll explain the differences between the two to help you make an informed decision. Radiant floor heating 1 can either use heating coils (electric) or plastic Pex tubing carrying heated water (hydronic) to warm your floors. The heat generated in the floor then radiates into objects it comes in contact with, like tables, chairs, and sofas, warming your space from the ground up. Heat is evenly distributed throughout each room which means cold corners near an outer wall can be just as warm as the middle of the room. Hydronic systems, in particular, can take a longer time to warm up but once the space is heated, the effects will last longer as heat radiates throughout the entire floor. Electric systems are best used as an add-on in a specific room or area, like in a small bathroom or near a vanity whereas hydronic systems are intended to heat an entire house. Radiators use hot water or steam to heat their coils, which then warms the surrounding space through radiation and convection. Multiple radiator units are needed in each room to fully warm the space. However, these systems are generally quick to produce heat, and each room can be controlled by its own thermostat 2 allowing you to match your heat usage to how often you are in each room. Radiators are generally installed along the edge of outside walls, and some heat can be lost to the exterior of your home as heat radiates outwards. The costs to install radiant floor heating 1 can be quite high, and in most cases, it can’t be installed on existing flooring. This means that your flooring will need to be ripped up and replaced along with the installation of the radiant heating system, making this type of improvement best when doing a full remodel of an existing home or building a new one. Retrofitting often takes longer than installing tubing over a floor that is clear of existing fixtures. 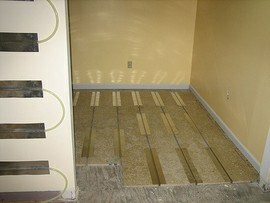 In a new build, coils or tubing can be directly set in large areas on the subfloor 3, requiring less labor. 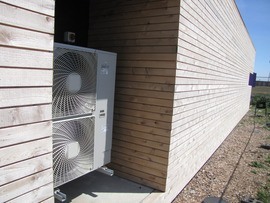 Individual radiator units are best installed in the coldest part of a room, and this usually means directly underneath a window or along an exterior wall. Multiple units are likely needed in larger rooms in order to heat the space more evenly and consistently, meaning that costs are likely to be higher if you’re looking to heat a large living room versus a small bedroom. It’s also important to ensure that radiators aren’t placed near drapes or by furniture that could block heat from radiating into the space. Radiant floor heating 1 is a more expensive option, especially in the case of a remodel, because of the labor needed to install the system and ensure it is properly anchored to the existing subfloor 3. Further, the need for either a radiant x-block installed to your existing hot water heater or a full-boiler system for larger projects will increase costs. A high-efficiency boiler system costs on average $4,000 along with a hot water heater or x-block that run between $1,000 and $3,000. The installation cost will vary depending on the amount of labor required to complete the work, with remodels in smaller spaces requiring more time. On average, expect to pay between $50 and $70 an hour for installation. On average, hydronic radiant heating systems for a home cost between $6,000 and $14,000. If you’re installing an electric system in a small space like a bathroom, costs average around $700. Radiators can be a less expensive option that makes use of your existing boiler system and hot water heater. The cost of individual radiator units depends on the size and can range from $100 to $500 dollars each. If a new boiler and hot water heater are needed as well, costs will increase with a boiler averaging $4,000 and a hot water heater averaging $1,600. Labor costs average between $50 and $70 an hour. If a single radiator is all that’s needed, expect to pay around $500. However, the average cost for four radiator units, a boiler, and hot water heater is between $4,000 and $10,000. Radiant floor heating 1 can be very energy efficient as it is typically zoned and controlled by individual thermostats 2 in each room. 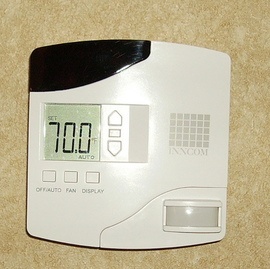 This allows you to only heat areas of your home that you’re occupying. Heat generated in the floor and radiated to surrounding objects stays at foot level, rather than rising and cooling through convection processes. This means that you’re not paying to force heat upwards towards your ceiling, and you stay warmer. It’s even distribution of heat across the entire flooring surface in a room means that regardless of where you sit in your space, the temperature is consistent. On average, thermostats 2 can be set 4 to 5 degrees lower than with other heating systems, which can add up to significant cost savings year over year. Generally, radiators are less efficient as the heat they generate is cycled throughout a room using convection. This naturally occurring process sees heated air from the radiator rise to the ceiling, cool, and then sink downwards. Convection can produce hot and cold spots throughout a room, which may mean you need to turn up the temperature in order to warm a room properly. This will result in using more fuel to heat the water in your radiator and pipes. Because of the placement of radiators near windows and along exterior walls, heat is lost to the outside, reducing efficiency. 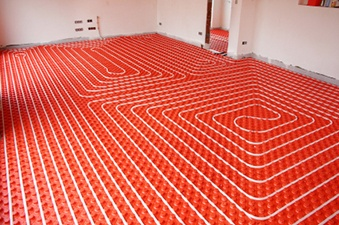 Radiant floor heating 1 systems are durable and can last up to 35 years. Typical radiators and piping systems can be expected to last between 15 – 20 years and will then likely require complete replacement. Radiant heat flooring has several considerations and restrictions when it comes to what type of flooring material you can install over it. While non-insulating, manmade materials like tile and laminate will give you the best, most consistent heat, it’s still possible to use radiant heat with other floors. When using radiant heat with carpeting, make sure that you set these rooms on a separate thermostat 2, as they will require more energy due to carpeting’s insulating properties. 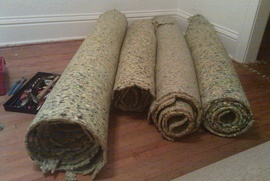 A high-density, low R-value pad 4 is required to use radiant heat with carpets. When installing radiant heat beneath wood flooring, you will need to take care to use the right type of wood to avoid cupping or swelling of the boards due to rapid changes in moisture caused by the heat drying out the wood. To counteract this, always heat the floors slowly, or choose more stable flooring, such as engineered hardwood, which is not subject to the same moisture changes as solid hardwood. 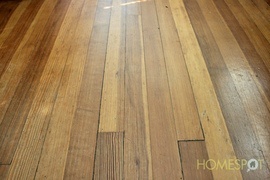 Narrow planks - less than 3-inches in width - warp less than wider planks, making them the better choice. Radiators do not affect the type of flooring you have, and can be used with any flooring type. Regular maintenance of hydronic radiant floor heating 1 is relatively easy and focuses on the functioning of the boiler, hot water heater, and pumps 5 used to move the water throughout the plastic Pex tubes. However, if there is a leak or repair needed to the tubes, it can be costly as it can be difficult to locate the problem because it can’t be seen under the flooring. Maintenance of electric radiant heating is very minimal, but if the system requires repair, the entire floor will likely need to be removed to locate and repair the problem. Radiators and baseboard piping require more ongoing maintenance including annual “bleeding,” which means to release any air that has built up in the system. This can be done with a bleeding key inserted into a valve on the unit. 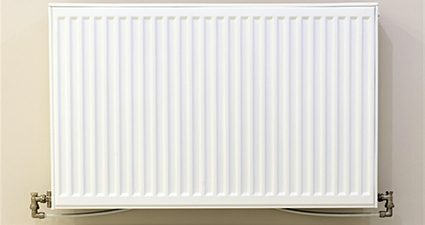 Without regular bleeding, radiators won’t function properly. Leaky valves and corrosion of pipes over time are also issues that may need to be addressed. Radiant floor heating 1 is thought of as a “high-end” or luxury feature in a home and may increase resale value. Radiators have no impact on the resale value of a home. Proper maintenance and care of all heating systems is an important factor in any property sale. How much does it cost to install radiant floor heating or radiators in my city? Cost to install radiant floor heating or radiators varies greatly by region (and even by zip code). To get free estimates from local contractors, please indicate yours. A device that senses and regulates temperature by turning heating and cooling devices on and off. Cost Considerations: Manual thermostats are the least expensive type available on the market ($25 to $60). Programmable thermostats are more expensive initially ($90 to $150) but may save up to 33% on heating costs and 15%-25% on cooling costs. Smart thermostats are the most expensive option ($200 to $300). A cushion placed under a carpet to absorb impact, thus extending the life of the carpet. Cost Considerations: Bonded Urethane is the most economical. Prices vary depending on thickness and quality, but a 6 to 8-pound density Rebond pad generally runs about $0.39 to $0.45 per square foot. Flat rubber padding is generally the most expensive. It may last through one or more sets of carpet, but is often hard to find and may need to be specially ordered--adding to the overall cost. A device used to move air, liquid, or gas by mechanical means. Cost Considerations: On average, a swimming pool water pump runs approximately $450 to $600 depending on the size required (based on pool volume). Water pumps for ponds and fountains are less (between $20 and $150 depending on the type). Many new water pumps have motors that are 93% energy efficient.